Heading home for the holidays? SG HQ is here to make sure you can focus on fitting all those gifts in your suitcase instead of worrying about what to pack. If your family gatherings are anything like mine, you’ll want to be comfortable (hello, 12 solid hours of eating) yet still primed for frequent – and quickly shared – photos. This is where comfortable-yet-stylish looks come int play. Think: a cable knit sweater paired with dark denim. 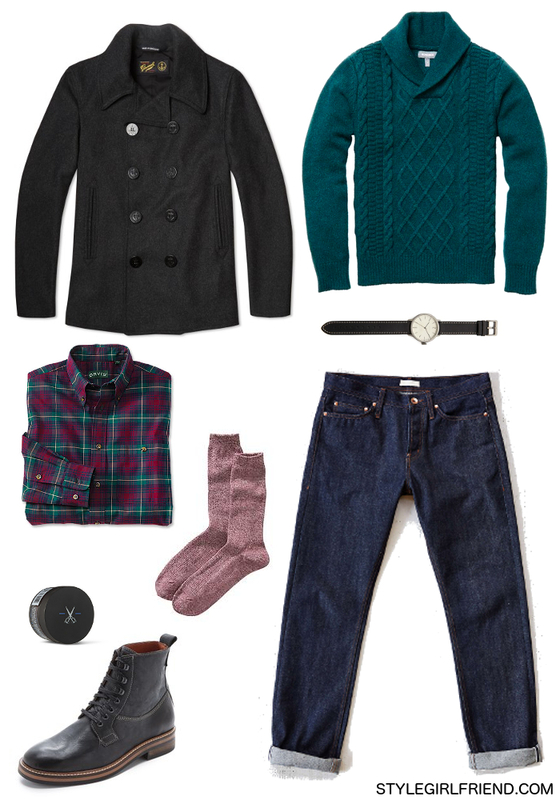 Start with a seasonal plaid that complements your shawl collar sweater, then stick to simple additions like leather boots and a flattering black peacoat for an easy combination that you’ll want to wear all day. Wear it well: While you may want to show off your brand new boots you just received during your family gift exchange, refrain from making the styling mistake of tucking jeans (or any pants) inside your boots. If your pant break is a little longer than you’d prefer on top of your sharp footwear try out a tight cuff or two without going too short, of course. For you fellas worried about the proportions of boots…any body type or height can wear boots just as you would an oxford or derby because your pants will fall atop the boot – just choose the style you’d feel most confident wearing. WHAT’S THE “DRESS CODE” AT YOUR FAMILY GATHERINGS?